Being a hater ? Well that's new to me. I have nothing against Goff, why do you say that ? I hope his success more than anything but what i saw on the field in PS doesn't inspire much. * - Doesn't count the TD that Kupp recovered in the end-zone. I'm not sure how you're acting as if he performed poorly in the preseason. He threw 1 bad passes (the read was correct, but the pass was bad). Beyond that, what's there to complain about? He was nearly perfect against the Raiders. He played fine in his limited snaps against the Cowboys. And he started off great against the Chargers until the Bosa sack (which wasn't on him) and the INT. Goff is 22 years old. He's a second-year QB in a new system. He's not going to be perfect. He's going to have inconsistencies. That's normal for QBs until they hit their late 20s (around age 26 to 29). But he looked plenty good in the preseason to me. It's clear he's progressed quite a bit from last year. The preseason doesn't mean anything, but I certainly didn't see concerning play out of Goff. You are really making a comparison between proven veteran QB and Goff ? The thing is their performance didn't matter as we already know their ceilling and it will be just fine in regular season. 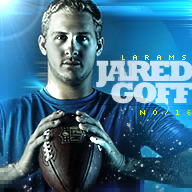 Goff doesn't take part of the group above, he's far away and stats in PS doesn't mean anything, you shoud know by now. I'm not saying it will be the same thing as last year but you have to stop seeing everything positive about Goff. Well i don't know, but am i the only one who's concerned about Goff this year ? Heck how can you not be worried a little bit specially when Mannion was looking slighty better than him with the second team. I saw throws that i really like and i didn't saw with Goff. Mannion has sucess throwing deep to Reynolds who play the same position than Watkins and we didn't saw that with Goff. Watkins was totally ignore by Goff except the nearly TD in the red zone against the Boys i think. Ok, maybe you will say, it takes time to build chemistry and all but that bothers me a lot. And is it a coincidence that when Kupp is not here to play, his performance is down ? And i'm not saying we have to start Mannion over him but there's some area i'm not confident with Goff. We will see what happen in the first half of the season and if i was totally wrong about these concerns. Yes, I'm making comparisons between the performances of Goff and veteran QBs because it undercuts your claim that Goff's preseason performance was concerning. Yea, the Rams sucked. We both didn't enjoy it. At the end of the day, I didn't lose anything from being optimistic. And you have to stop seeing only the negative with Goff. He completed 75% of his passes in the preseason. The Rams scored on 5 of his 8 preseason drives. How can I not be worried? I saw a guy who was making the right reads, standing tall against pressure, and making accurate throws (except for a handful, including the Int). We did see that with Goff. We saw Goff hit Kupp for a long TD and drop a perfect throw into the basket with Watkins that he dropped that should have been another TD against the Raiders. You don't have to be confident. It's fine if you're concerned after last year, but don't try and claim that his preseason performance didn't inspire any confidence. You're basically brushing off the good as "just the preseason" and focusing on the very little bad that was present. 18 touchdowns 13 ints -2 rushing td 3200 yards -59 percent comp is what I feel like he will have . The O-line just needs to giving the kid time and WR/TE need to win their matchups and get up. He's shown he's comfortable fitting it in tight windows and throwing to a spot that only his guy can get it. The defense will need to keep us in games because I don't think he's ready to have to come in and save a game being down 2+ scores. But gaining and maintaining a lead can be done by him. Feeling better about him than last year thanks to coaching. I wasn't a fan of his coming out, mostly due to what Fisher's offense expected from QB play so this is pleasant to watch. Goff so far this season looks like the 1st overall pick. People are praising Wentz but I heard a stat that Wentz has nine "should be turnover" plays this season which leads the NFL. He already has like 2 interceptions and 3 fumbles (1 lost). While he still looks has looked good despite what I mentioned, he is making plays and one could argue the Eagles could be 2-0 easily by the way they beat Washington and played KC tough on the road, I think Goff has looked better. Goff right now has looked like one of the better QBs in the NFL to start the young 2017 season. So if anyone is still having doubts about the Rams giving up a lot to move up in the draft to choose him as their franchise QB, Goff is starting to prove you wrong. He will only get better. Btw, I see why many scouts compared him to Matt Ryan coming out. Wetnz was garbage in the redskin game. He was garbage majority of the season last year, and gets passing yards because he has the first or second most attempts in the league since last season. Dak has also been garbage this year. The problem though is so many talking heads have already anoited these guys and jumped on the bandwagon that they dont want to get off. Yeah Wentz doesn't have a run game at all. He is still raw. No way he is better than Goff. The only edge he had was the coaching staff year one. Now that Goff has a coaching staff, you can see why he was the 1st overall pick. The Browns wanted Goff but saw the Rams trades up to get him and they bailed out of the 2nd overall pick because they didn't want to draft Wentz. I like Dak but his notoriety is coming from the fact he plays for Dallas. Loved how he played last season and one bad game this season but for better or for worst it's Dallas and the media will talk about them at nausea whether they are winning 12 games or losing 12 games. So Jared has now started 16 games and it's quite the turn around from the first 7 last year. Clearly Mr. Gonzalez misunderstood this statement. 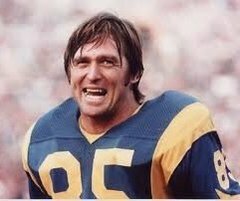 What the Rams coaches meant was "wait and see" what we're about to unleash on this league.